Do you realize that hairdressers are more heavily regulated than a mom and pop tax shop who offers to prepare your tax return? There is even reported to be a Laundromat in the Bronx offering tax prep services. 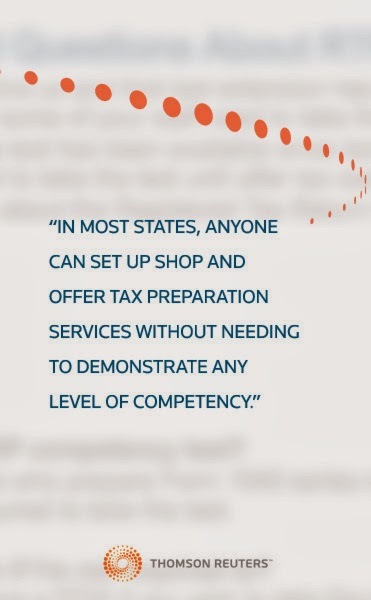 In most states, anyone can set up shop and offer tax preparation services without needing to demonstrate any level of competency. Currently, only three states (California, Maryland, and Oregon) have laws addressing the necessary qualifications to prepare federal or state income tax returns. Shouldn’t you look for a well-qualified individual to prepare your taxes? After all, you are legally responsible for the information in your tax return whether you pay someone else to prepare it or not. The Internal Revenue Service tried to regulate unregistered tax preparers but has been temporarily stopped as the result of U.S. District Judge James E. Boasberg’s ruling in favor of three independent tax preparers. The judge found the IRS had exceeded its statutory authority in imposing requirements for mandatory testing and continuing education for tax return preparers. Congress is considering giving the IRS that authority. Not everyone is waiting on the IRS. The state of New York, Department of Taxation and Finance, proposed amendments to its Personal Income Tax Regulations and Procedural Regulations to regulate New York tax return preparers. The proposed rules would add requirements imposing minimum standards on who can become a tax return preparer, instituting a continuing education requirement, and requiring a competency exam, all similar to the IRS‘s Registered Tax Return Preparer (RTRP) program. To further muddy the water, the new Commissioner of the IRS, John Koskinen, has come out in favor of a volunteer tax preparer certification. This is basically the RTRP approach only on a volunteer basis rather than a mandatory requirement. 1. Wait until Congress gives the IRS authority to regulate tax preparers. 2. Implement tax preparer regulations by state governments. 3. Adopt a volunteer certification program. Only time will tell which of these options will win. Which one do you think should be used?